Five decades after reunification, the city of gold, bronze and light is gleaming. But the future wasn’t always this bright. Fifty years since the reunification of Jerusalem, Israel’s ancient capital enjoys every promise of a prosperous tomorrow. The once sleepy city has emerged as a top cosmopolitan and technological hub, its streets home to luxury malls and lively markets, cutting-edge start-ups and colorful spice shops. But Jerusalem hasn’t always thrived. While under Israeli rule, all religious groups are able to freely access their holy sites, the city’s older residents remember an era when basic freedoms were never guaranteed. Jerusalem was divided between Israel and Jordan for 19 years following the Jewish state’s War of Independence. When the Jordanians first captured the Old City in May 1948, they expelled all of its Jewish inhabitants, then embarked on a campaign to erase the city’s ancient history. 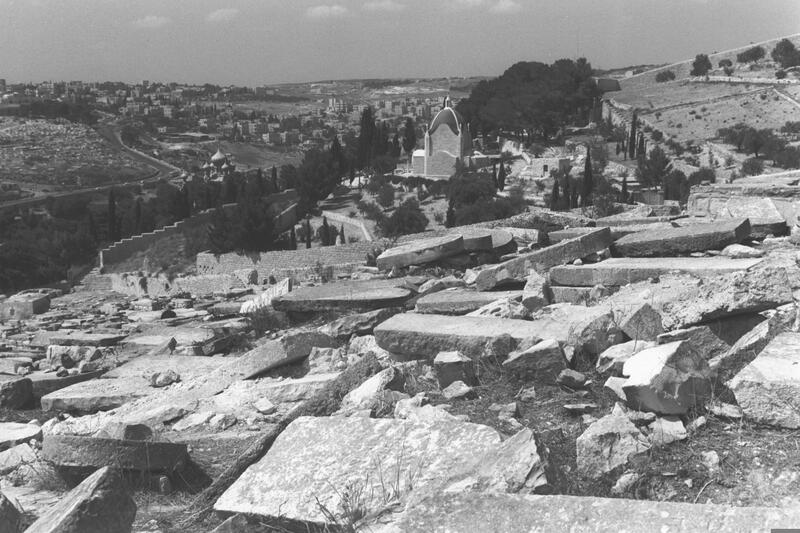 Over 50 synagogues in the Old City were destroyed, while ancient Jewish graves on the Mount of Olives were ransacked and Jews were barred from visiting their desecrated holy sites. Jordan also imposed restrictions on the city’s Christian population, including by controlling the materials taught in Christian schools and forbidding Christian charities and religious institutions from purchasing property. 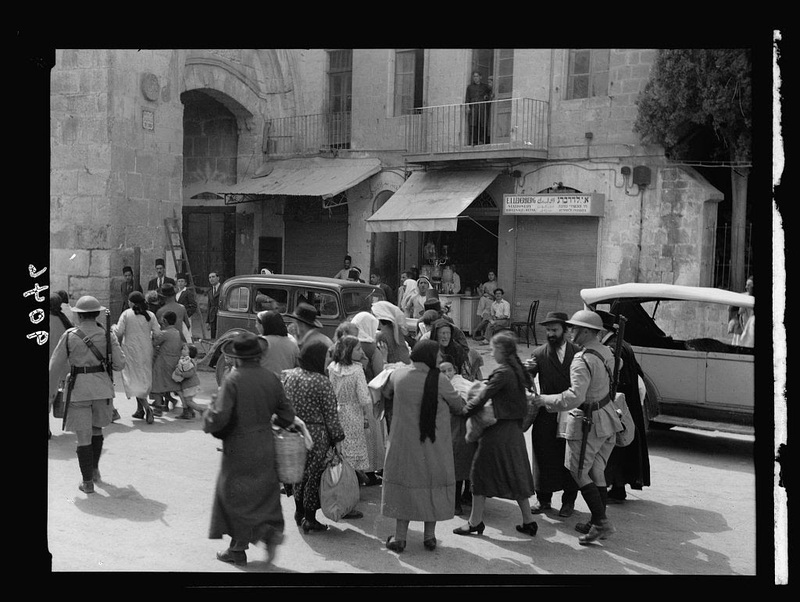 Below are snapshots of the city from the mid-19th century until June 7, 1967 — the 28th day of the Jewish month of Iyar — when Israeli forces secured the Old City after two days of fighting with Jordan. 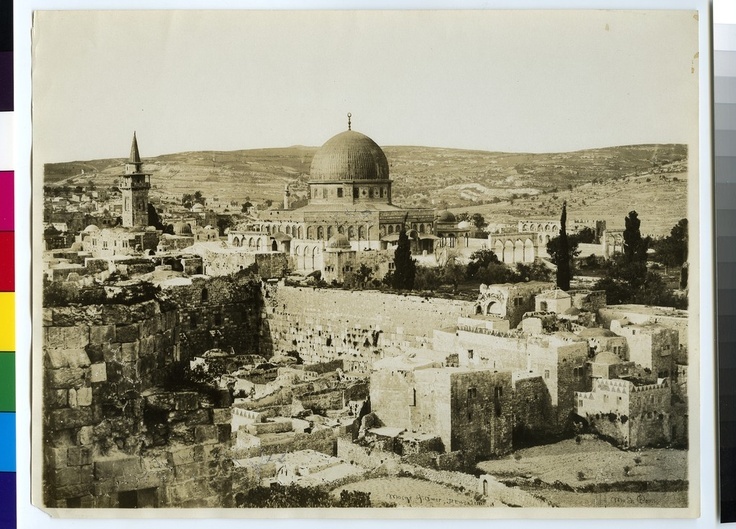 The Temple Mount as seen from the Jewish Quarter, 1850s. 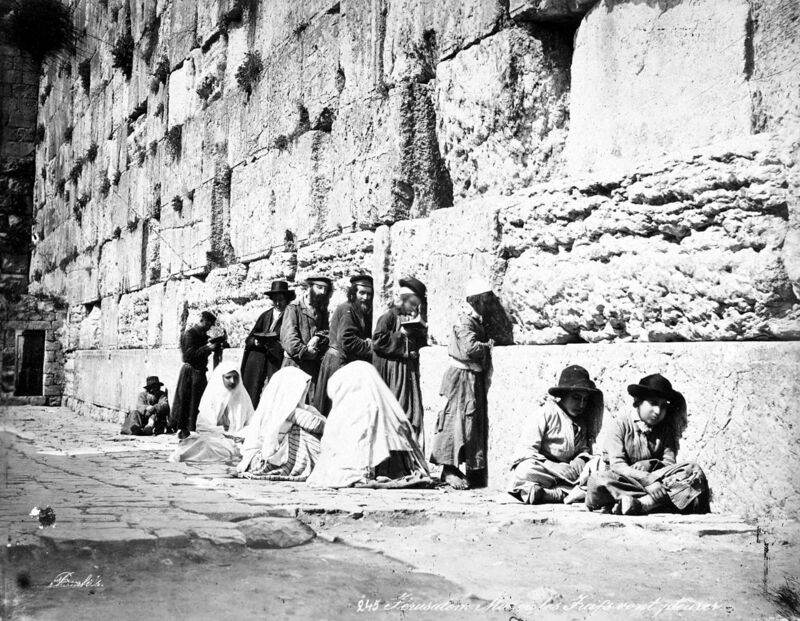 Jews at the Western Wall, 1870s. 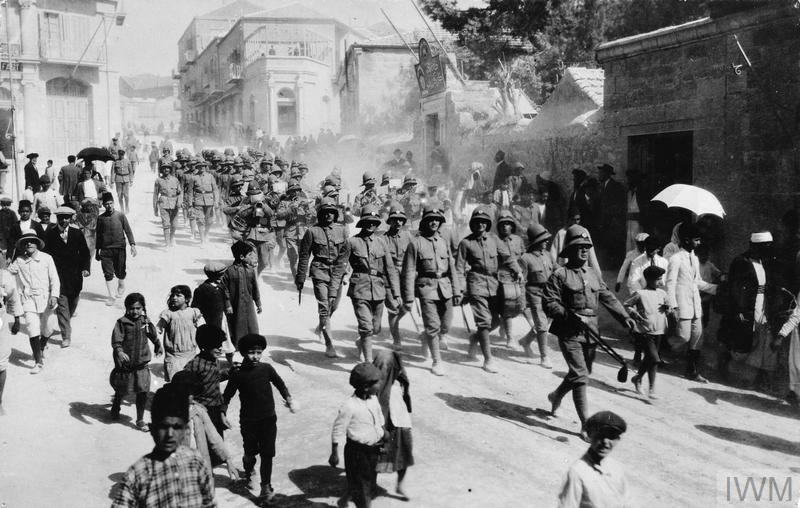 German soldiers on their way to attend a religious service on Good Friday in Jerusalem, 1917. 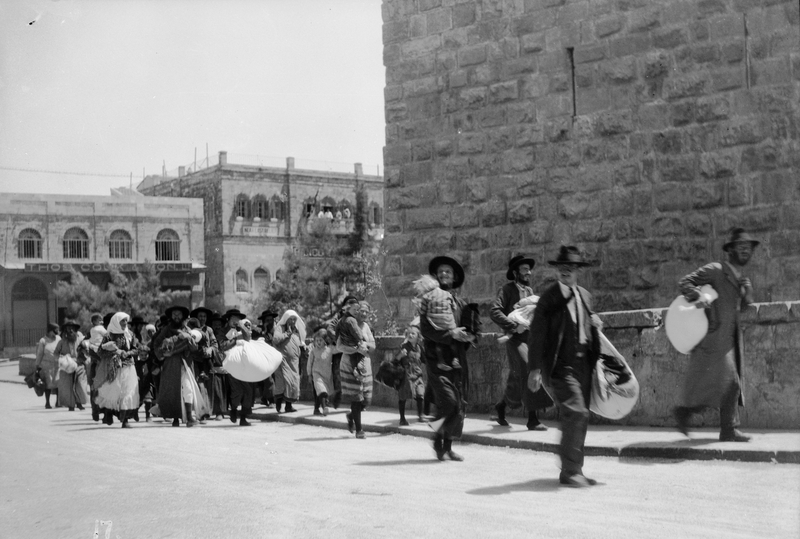 Jews fleeing Jerusalem’s Old City during the 1929 Arab riots. 133 Jews were killed in the massacres, with over 300 others injured. Jews being evacuated from the Old City by British soldiers during the 1936 Arab revolt. 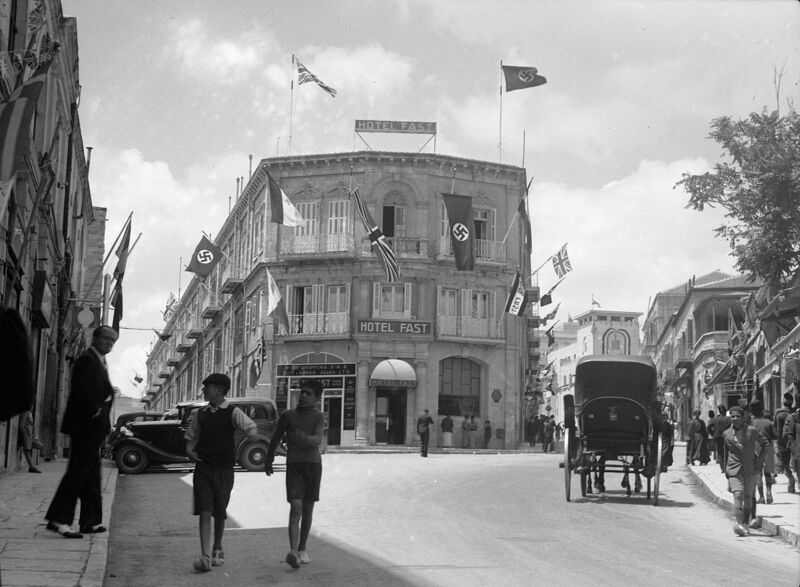 British and Nazi flags flying from the Fast Hotel on Jaffa Road on the occasion of King George VI’s coronation, 1937. 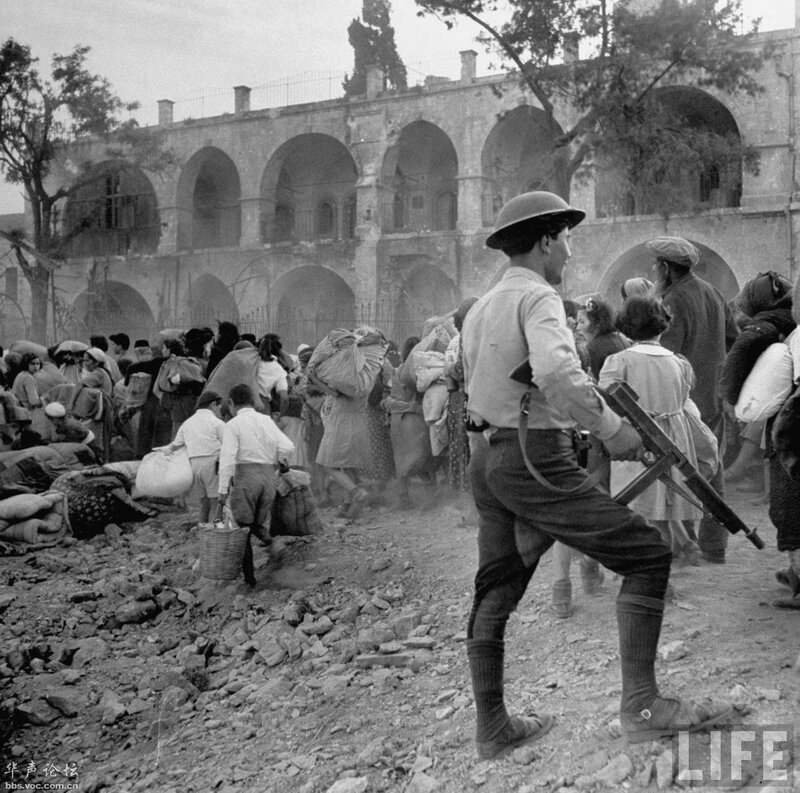 Jews being expelled from eastern Jerusalem by Jordanians during the 1948 war. 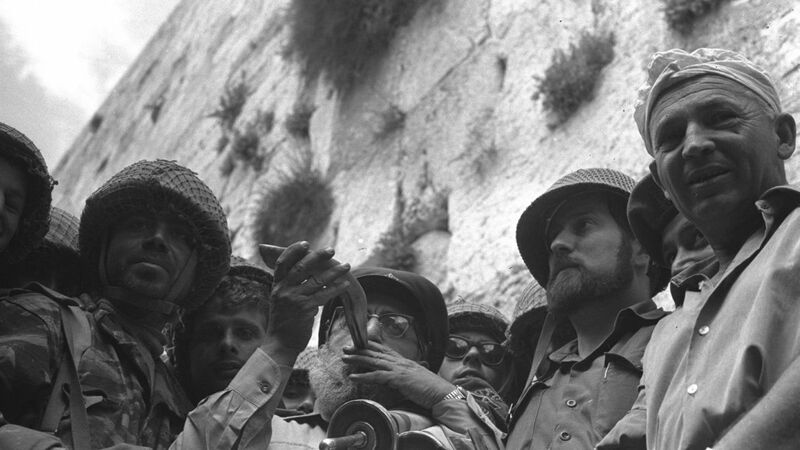 IDF Chief Rabbi Shlomo Goren blows the shofar at the Western Wall on June 7, 1967, shortly after it was captured by Israeli troops. 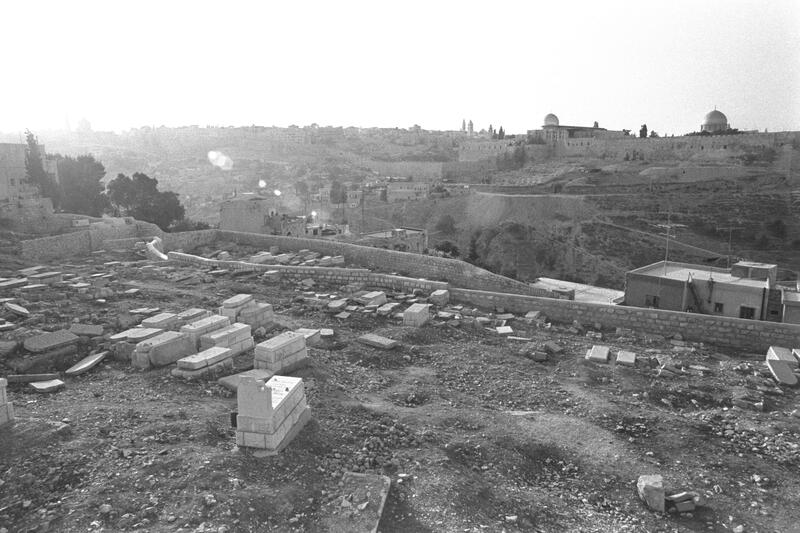 Desecration of the ancient Jewish cemetery on the Mount of Olives, photographed in 1967. About 38,000 stones and graves were smashed, with some used by the Jordanian army to build roads or staircases. 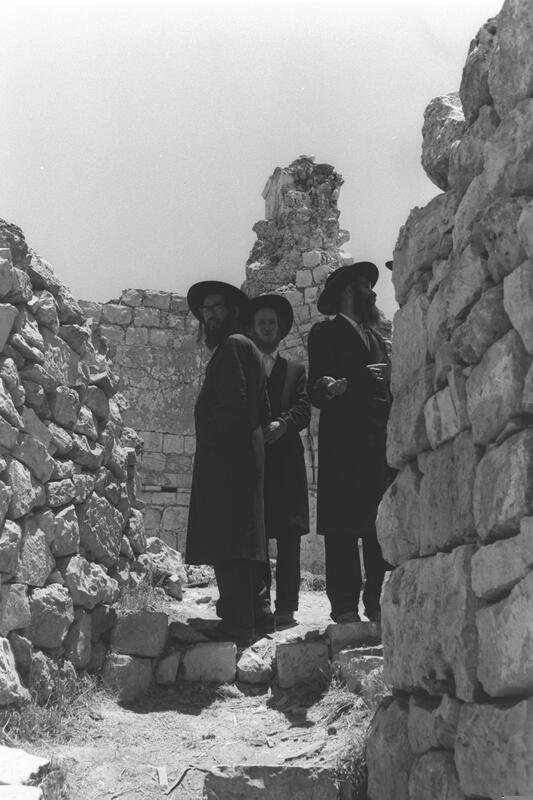 Former residents of the Jewish Quarter in the Old City visiting the ruins of the Hurva synagogue in 1967. 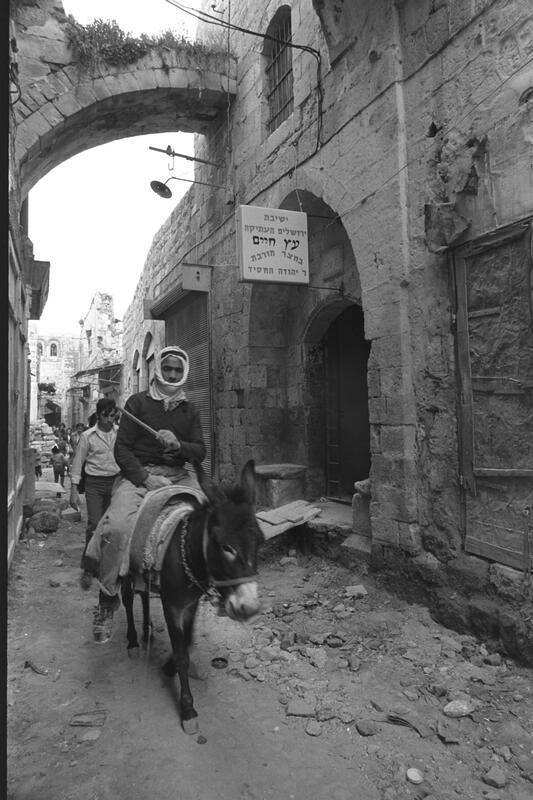 Street of the Jews (Rehov Hayehudim) with entrances to ruins of the Etz Haim yeshiva and the yard of the destroyed Hurva synagogue in the Old City of Jerusalem, photographed in 1972.